View of “Yoko Ono: To The Light,” 2012. Yoko Ono has been woefully underappreciated in the UK, where for decades her poignant Conceptual practice has been overshadowed by her marriage to John Lennon. The Serpentine Gallery’s concise and compelling showcase of key works from the 1960s to the present, the artist’s first solo exhibition in the UK since her retrospective at Modern Art Oxford in 1997, is an essential opportunity to redress this imbalance. The artist’s exploration of the human body, in particular its vulnerabilities, is a gently recurring theme throughout the show. In A Vertical Memory, 1997, a series of short texts accompany twenty-eight identical, black-and-white, blurred photographs of a man’s face, each of the works reflecting on a patriarchal figure. Among them, “Doctor III” is both a curative and invasive presence that reads: HE HAD ONE TOOTH MISSING AND SMELLED OF ALCOHOL. HE TOOK MY APPENDIX OUT. The emotional range of Ono’s work vacillates between morbid foreboding and childlike wonder, and the artist is expert at using minimal means to achieve quietly powerful formal, conceptual, and political ends. A Winter Light, 2012, consists of what appears to be a human body wrapped in cloth, slumped atop a shelf ten feet above the ground. AMAZE, 1971/2012, is a glass maze that ultimately leads one—contained within walls yet exposed to view—to a mirrored pool of water hidden within an opaque, private core. In another piece, Ono exploits the power of the imagination to devastating effect. 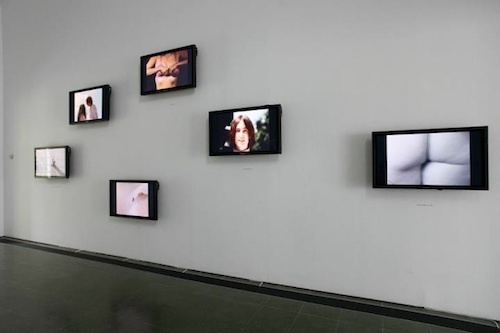 The sound of a heartbeat relentlessly pulsing through the gallery at first evokes images of birth and life; however, seeing the title Heartbeats/Syria, 2012, forces one to reckon with the savage killings taking place at this very moment.